A Kuerig coffee maker is unique in the sense that it allows you to prepare coffee in separate servings. You can prepare just about any kind of coffee mix with the help of this machine. Given the level of convenience it provides, many people are making a switch to Kuerigs. 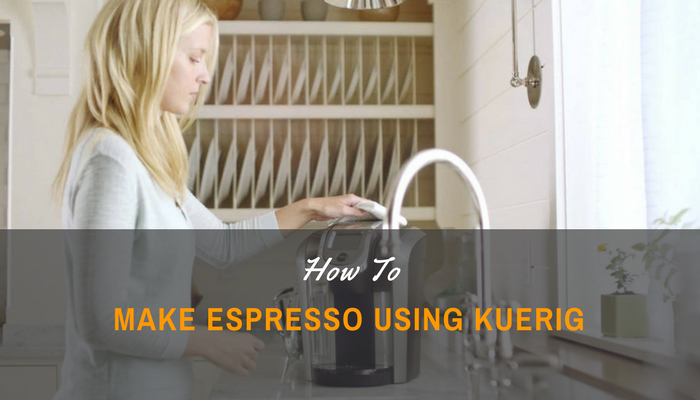 If you’re wondering about how to make espresso using Kuerig, you need to know a few things first. Technically, you cannot prepare a true espresso with this device, as only a dedicated espresso machine can do that. However, you can prepare just about everything else with the help of a Kuerig coffee﻿﻿﻿ maker. Here is how you can do it. Prepare your machine- Locate the water reservoir of your machine. Its location can vary from one model to the next. Regardless of the type of model you are using, make sure to not overfill the reservoir. You will see a marker on the reservoir that says “max fill”. Only fill with water up to this mark. As for the type of water you can use, it is advised that you don’t use water that has too much mineral content. This is because mineral buildup can eventually damage your machine. Use a K-Cup- The K-Cup is a proprietary package by Kuerig that is used for preparing a cup of coffee. You will insert the K-Cup in its designated slot as is; there is no need to open the foil, put a hole, or do anything else. This is because the machine itself will do the piercings by itself. Basically, you won’t have to worry about water not flowing into the cup while you’re brewing. K-Cups are found in all kinds of flavors and concentrations, so you just got to choose one that you like. Start brewing- Place the cup, mug, or tumbler of your choice underneath the spout before brewing. Once in place, press the “brew” button in your machine. Some of the more advanced Kuerig machines have a brew size function, which allows you to select the amount of coffee you want in your cup. Once you press the “brew” button, all you have to do is wait for your coffee to get done. The entire process should take about 1 to 2 minutes. Once liquid stops pouring out of the spot, your coffee is ready for consumption. Of course, you got to take care of your Kuerig machine so that you can continue enjoying good-quality coffee for a long time. So how will you do it? Here are some of the basics. Remove the K-Cup after brewing- Open the cover where you place the K-Cup. Remove the used cup and dispose properly. Extra care must be taken when you just finished brewing as the K-Cup can get very hot right after use. It would be wise to let the K-Cup cool down a bit before removing it, or at least use protective equipment for your hands. Schedule periodic cleaning- After a number of uses, your Kuerig machine becomes dirty. So what are the signs that you need to start cleaning your machine? When you start noticing stains, when your drip plate tray becomes full, or you observe mineral buildup, your machine is due for a cleanup. Wipe the exterior with a soft cloth, using soap and water when necessary. Periodic descaling is recommended every 3-6 months. Rinse the drip tray and pack holder with soap and water. Clean each part individually, but do not submerge the machine itself into water. While you cannot make authentic espresso with the help of a Kuerig machine, it won’t prevent you from enjoying good-tasting servings of your favorite brews. Just make sure to use the machine according to instructions and you won’t have any problems.